children learning to cook, Cooking with LIzzy, Food Network, Pampered chef dredging trays, Recipes, Whatever Happened to Dinner? Cooking with Lizzy, Part 2: How many 12-year-olds cook Spaetzel, gnocchi, schnitzel, piccata, tom khi gai and bolognese? When Lizzy was 7, which is where we left off last time, her mother participated with others in a Sunday school class I taught at our church related to the 2010 publication of my book, Whatever Happened to Dinner. 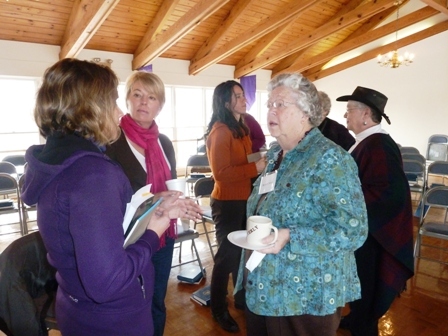 Lizzy’s mother, far left, in after-class discussion on Whatever Happened to Dinner? In the class one of the things we talked about was how picky eaters can spoil the enjoyment of a family meal. Virginia mentioned she had found that her kids were enjoying a new step she’d taken to plan menus with the help of the children, and that they ate much better when they could have a say in what was being served. I thought that was a wonderful idea. Lizzy (whose favorite foods are way beyond this now) remembers her choice of meal to put on the menu each week was homemade mac and cheese. Her father made it, using a typical white sauce and a mix of whatever cheeses they chose or had on hand including Swiss, cheddar and more, with Panko bread crumbs on top. 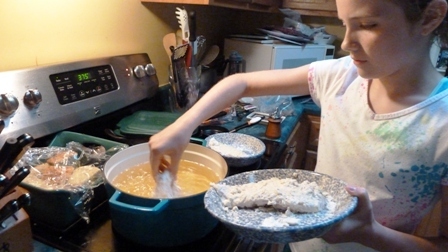 Her father grew up in a military household and lived most of his early life in Germany, so Lizzy also has learned to make several German dishes he loves such as spaetzel (egg noodles), and schnitzel (any of various boneless meats sliced thin, coated in egg and flour, and fried). He also loves gnocchi (soft dough dumplings) after living in Italy and graduating from Naples American High School there. She enjoys following and adding recipes to her mother’s 33 boards on Pinterest. Now of course Lizzy knows very well what a dasher is and does and personally owns a beautiful 5-quart Dutch oven (see photo), cast iron skillet, pasta maker, food processor and more, because she asks for these things for birthday and Christmas. 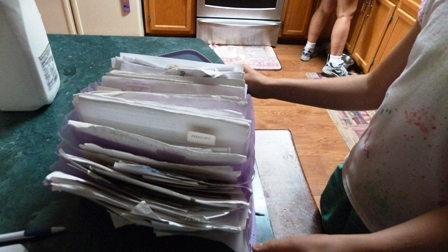 Lizzy shows me her large expanding plastic file folder stuffed with print outs or clipped recipes from newspapers and magazines. 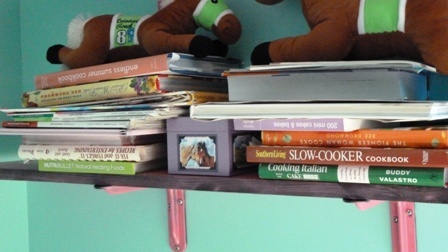 She points out, “Grandma has a whole crate of recipes like this.” Lizzy leads me to her own personal collection of cookbooks she keeps on a shelf in her neatly straightened bedroom. If she has a really busy night, she plans around it, her mother adds, like any adult would. If the family needs to be somewhere early, such as for a football game, she makes chili or a beef stew in the morning or the evening before to take to the game. Tonight she is making fried chicken. I arrive about 5:30 p.m.; dinner is usually planned for around 7. She gets five or six huge boneless Costco chicken breast pieces from the freezer and puts them in a microwavable pan to begin thawing. She fetches the neatest series of interlocking Pampered Chef dredging trays where she will dip the chicken in seasoned flour and thick, cultured buttermilk. 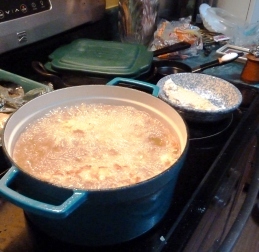 While we chat about the other dishes she likes to make and the cookware she owns, she eventually nukes the chicken without checking any notes or recipes. 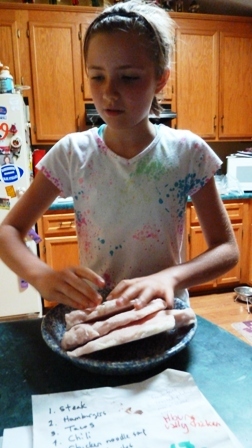 Since I have the video of her at 7, I thought you might enjoy this one of her at this age nuking the chicken. 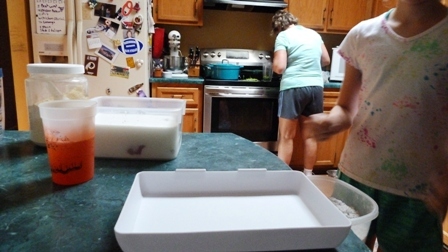 Once thawed to her liking, she plops a single piece of chicken in the dredging tray, and soaks it a few minutes, “to stay more tender” she explains, which she says she learned on the Food Network. Not surprisingly, The Food Network is her main television watching, competing for TV time with brother Sam who spends most of his time on ESPN. “We couldn’t be more opposite” Lizzy observes, but it is just a statement, not a put down. Lizzy tolerates football games for her dad and brother. 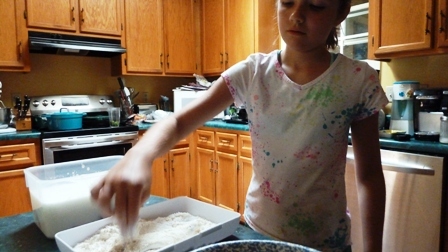 And while Sam loves the fried chicken, Lizzy will bake her own piece, just because she likes it better that way. 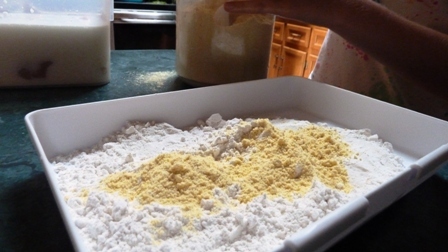 She removes the soaked chicken breast, rolls it again in a generous amount of flour spiked with pepper and salt, then dips it again in the buttermilk. “Oh, you do it again?” I ask, a little surprised. “Yes, it’s double dredging. It gives it a really nice texture” she supplies. I really must start watching Food Network, I decide. 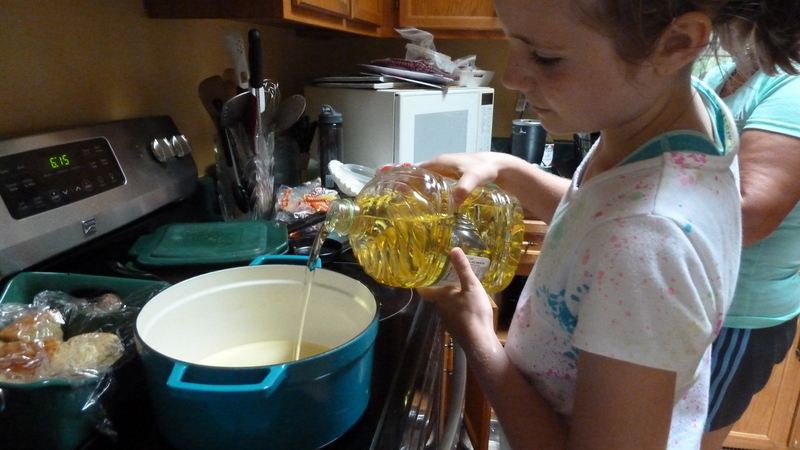 She chugs half a jug of vegetable oil into her Dutch oven-turned fryer. Wow. My daughters never even attempted frying chicken until they were well into their 20s. 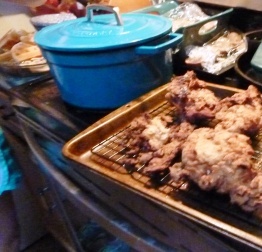 They too prefer baking or light sauteing of meats, but I think I was scared to let them try the big fry. 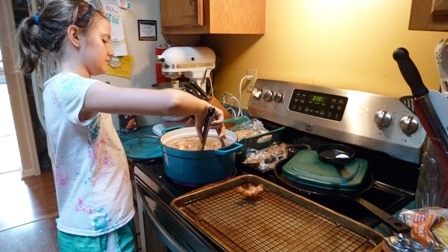 Not to be overly cautious about this, but I would carefully supervise any child beginning to fry foods, especially in oh-so-hot deep fat, and would make sure they knew where the kitchen fire extinguisher was and how to use it—and how to never put water on a grease fire but instead use baking soda—also kept handy in the kitchen. Just saying. (One of my daughters learned the hard way what happens when there is no baking soda handy; but in her defense, the rented house where she and other housemates were living also apparently had some faulty wiring around their gas stove. My daughter ended up having to call 911 and watching with dismay as firefighters smashed through a window and wall in the kitchen to put the fire out.) Things happen. The chicken fries up beautifully with lots of golden-crusty-floured-buttermilk coating sticking to the edges. Lizzy leans back a little when the grease pops. One piece sticks to the bottom of the pan, which Lizzy carefully nudges off the bottom with a spatula, keeping her distance and using mitts as appropriate. She tries to keep counters cleared and dishes stacked in the sink as she works. Her “pay” for doing most of the cooking is mostly getting out of doing dishes. But the planning ahead, cooking and making sure they have a complete meal, is mostly Lizzy’s arena. “It’s a gift she gives our family,” her mother says before heading off to her evening meeting. So what does Lizzy want to be when she grows up? We’ll learn next time. Do you watch Food Network? Why or why not? What are your favorite shows? I’m offering a package where any group gets three free copies of Whatever Happened to Dinner with any speaking engagement invitation, to use as door prizes, or whatever. Check the offer here. You have a winner here, Melodie. I’ve enjoyed all of Lizzie’s antics here, including the hand washing. Food network shows? Cooking with Ina and Pioneer Woman, who started out as a blogger, mind you! Glad you are enjoying the Lizzy posts. After I sat and watched her that evening, I was quoting stuff she said to my husband and daughters, I couldn’t get her skills and know how out of my mind. Pretty amazing young woman. Are you saying you watch Cooking with Ina and Pioneer Woman? So much out there, can’t keep up with it all! I agree with Lizzy re’ the chicken…I prefer baked also. My husband grew up with many things being deep fried…we like baking or broiling. So, no, I did not start frying things to make husband happy…he very nicely eats his baked chicken, broiled fish, baked french fries, baked donuts… without complaint. But I know he stops at a KFC or other place to get a piece of fried chicken now and then when he is out making deliveries, or some donuts if it’s an early trip. All that oil in combo with fire scares me. No we don’t watch the Food TV. We do not have cable or satellite…just the local channels on an antenna. We did buy ourselves a new flat screen for Christmas. It is not big, but we can now watch HULU on it and our DVDs. I used to like watching JULIA CHILD/THE FRENCH CHEF on public TV when I was growing up. I do so agree with not having to do dishes if you do the cooking! Love your stories and asides here–husband getting fried chicken or a donut when he’s out and about. So you watched Julia Child on public TV–I don’t think she would have held my attention for long at the time. Now, yes, certainly! Limiting choices on TV can be freeing rather than limiting, I’m sure. More time to do OTHER things. I wish I had a fast enough internet connection for HULU or other streaming (is that how you do it?). I may AGREE with not having to do dishes if I do the cooking but that wouldn’t get me anywhere. 🙂 My dad finally learned to do dishes in his old age. I don’t know if it’s called streaming when watching HULU. Just go to HULU.com. and try it out. You don’t have to pay. You can watch it right on your computer. But if you have regular TV, cable etc you probably wouldn’t even need it.